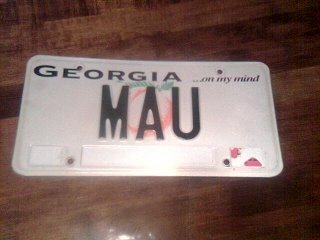 Something that makes me unique: I've got this weird thing about license tags. That's right. You read that correctly. 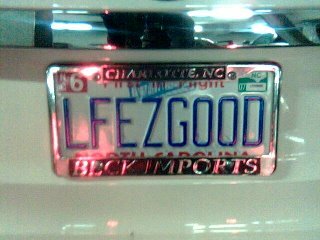 I read license tags. If I happen to see a tag that's a few digits off of mine, I think "That person and I were probably in the tag office just about the same time. We've crossed paths before." I'm very into the concept of this being a very small world, and the paths crossing and such. I also get a very small kick out of words or consecutive letters or digits showing up in license tags. 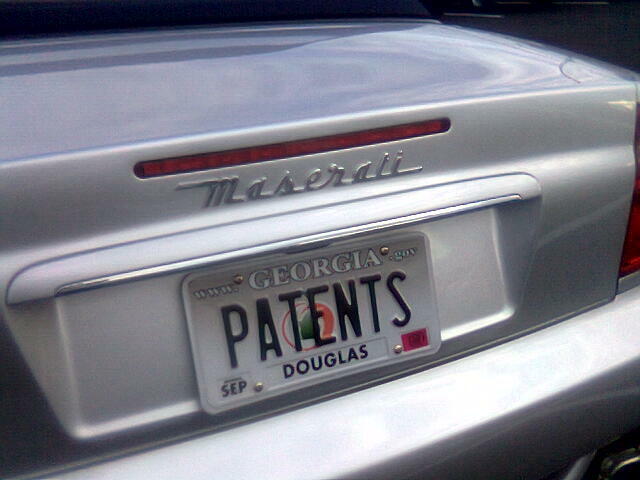 The other side of license tags is "vanity" or "prestige" tags. I find them fascinating. The reasons why people get them, as well as the reasons why people don't get them. The way I see it, for some people, a vanity/prestige tag is their one way of adding just a little bit of individuality to an otherwise pedestrian and ho-hum Honda Civic. For other people, a vanity/prestige tag can be a testament to what you spend your days doing. 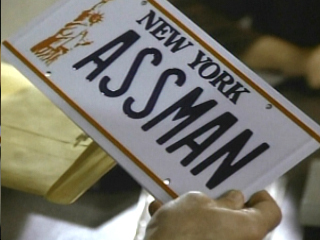 Remember "ASSMAN" from Seinfeld? 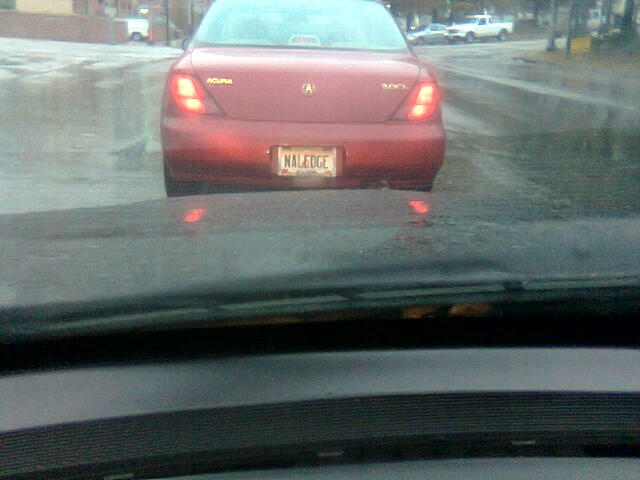 The last thing I'd like to discuss why some people DON'T get vanity tags. These days I often see people spend thousands of dollars customizing their cars. You see paint jobs, sound systems, custom wheels and custom interiors. So, tell me. After one spends all this time and thought and energy (not to mention money) making sure their car is "one of a kind"? Why not spend an extra $100 bucks to give it unique tag? Just a waste, if you ask me. With that, here are a few tags that I've seen lately. 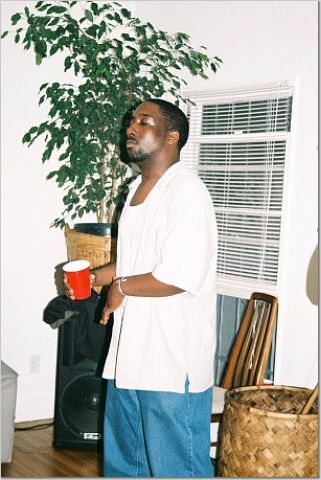 Some I have pictures for, some I don't. TNDRONI - Saw this one just last night, on a Mini Cooper. I found it nostalgic, and cute. BIGPERM -This one was a while ago. Found it hilarious. THEATL - Gotta love anyone that supports the The ATL. You probably can't even see this one, so don't even try. It says MOEJOE. 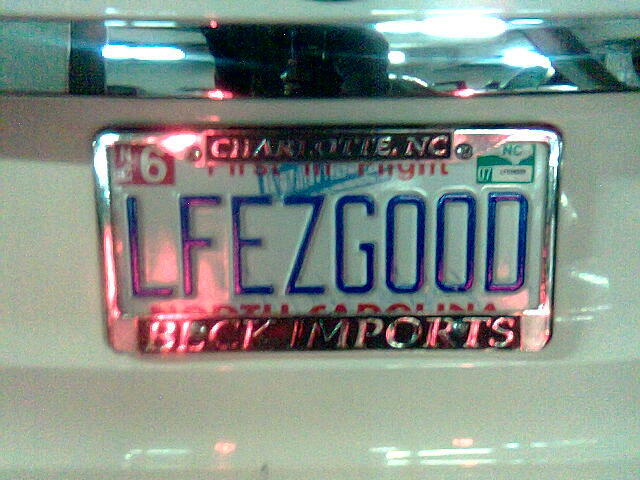 LFEZGOOD - I caught this one in North Carolina this past weekend. PATENTS - Was I jealous when I saw this one? No. Envious? Yes. NALEDGE - Caught this one today. Another cool thing about vanity/prestige tags is that it uniquely identifies cars. I really think I've seen this one before. 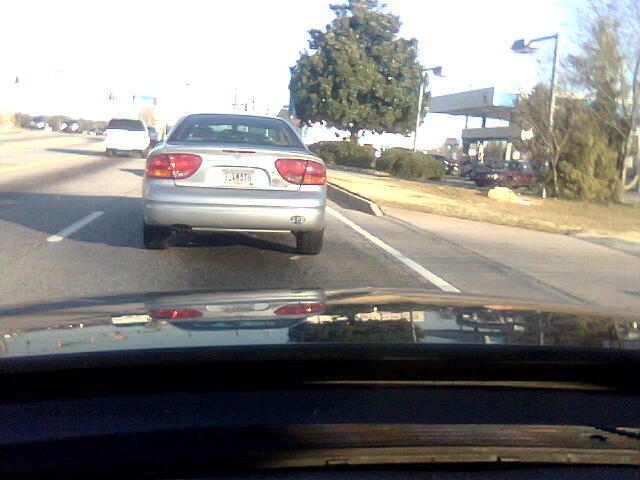 You can't really see this one, either, because I took it from my car after the light had turned green. I'll let you off the hook. It says ILVMATH. I've honestly used the camera on my phone more for this post that I've ever used it before. If' it's somehow against the law to put other people's license tags online, then someone let me know, okay? I'll see you in the streets. I've thought about having a vanity tag. Well, when I had a car. I just couldn't bring myself to give another red cent to the State after paying vehicle registration fees!